Bio: Rachel Burton has a degree in Cello Performance from Utah State University, and experience in graduate school. She is Suzuki Certified, and teaches full time. She has taken all of her training from pedagogue Pamela Devenport, and attends Suzuki Institute every summer. Rachel is a current active member of the Timpanogos Symphony Orchestra, and is the cellist of the Allante String Quartet which resides in Alpine Utah. She teaches all ages and all skill levels. Erica is a registered Suzuki cello teacher with a studio of twenty-plus students. She completed The School for Strings’ Suzuki teacher training program in New York City under Pam Devenport (2014) and has taken additional courses and enrichment classes with Alice Ann O'Neill, Carey Beth Hockett, Allen Lieb, and Mark Mutter. While in New York City, she taught at the Suzuki Music School of Westport in Connecticut and Turtle Bay Music School in New York City. Erica holds a bachelor's degree in music from BYU (2009), having studied cello with Julie Bevan and performed with the Philharmonic Orchestra under Kory Katseanes. 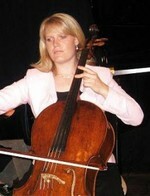 Erica grew up in Phoenix, Arizona, and studied cello with Jamie Guy Kellogg. She was a member of the Phoenix Symphony Guild’s Symphonette Orchestra and Youth Orchestra, and she was able to travel with those groups around the state and on tour in China. Currently, Erica lives in Saratoga Springs, with her husband and two young boys. She is a member of the Cello Committee for the Intermountain Suzuki String Institute, and recently became a Suzuki parent when her oldest son began studying Suzuki guitar. Elizabeth began her music study at the age of two and has been performing ever since. She earned her Bachelor of Music degree in Cello Performance from the University of Southern California where she studied with Eleonore Schoenfeld and Peter Stumpf. Elizabeth has also toured, collaborated and performed throughout the United States, Canada and Europe in various ensembles, and has been a featured soloist with several orchestras including the Utah Symphony, YMF Debut Orchestra, USC Symphony, and Grand Junction Symphony Orchestra. Mrs. Marsh has taught private cello lessons for nearly 20 years, and occasionally enjoys guest conducting youth orchestras and cello choirs. She recently published a cello scale book for young students, The Scale Trail Challenge for the Young Cellist, and is soon publishing books in the same series for violin and viola. Elizabeth and her husband Gregory love bringing their growing family to concerts and singing together with their children. They spend their date nights rehearsing and performing with the Mormon Tabernacle Choir and Orchestra at Temple Square, and enjoyed performing together with them last summer at Carnegie Hall. Chris began playing cello at age 10. He currently works as a full-time musician - performing, teaching, arranging, transcribing, and composing. Over the years, he has picked up 10 other instruments, but his first love remains the cello. Chris's performing experience includes Gladys Knight, David Archuleta, Lexi Mae Walker, Kurt Bestor, Dallin Bayless, BYU's Synthesis, the BYU Philharmonic, the Idaho Falls Symphony, and as principal cellist with the Utah Valley Millennial Choir and Orchestra. He has also done recording work for various artists such as Devin Townsend, Periphery, and Monica Moore Smith. Chris graduated from BYU with a Bachelor of Music degree. He lives in Lehi, UT with his wife and three children. Bio: Alan is a cello coach focused on enabling cellists to learn how to learn the cello and achieve greater levels of performance themselves. Alan works during the day in corporate learning and development and seeks to find ways that industry learning best practices can transfer over to help cellists improve their performance. For example, Alan posted videos of cello pieces on YouTube so that his students could watch them before and after the lesson to help them prepare for and reinforce what they are learning. Alan learned cello technique from teachers such as Ellen Bridger and Carey Cheney. He has been a member of various local orchestras such as the Orchestra at Temple Square.